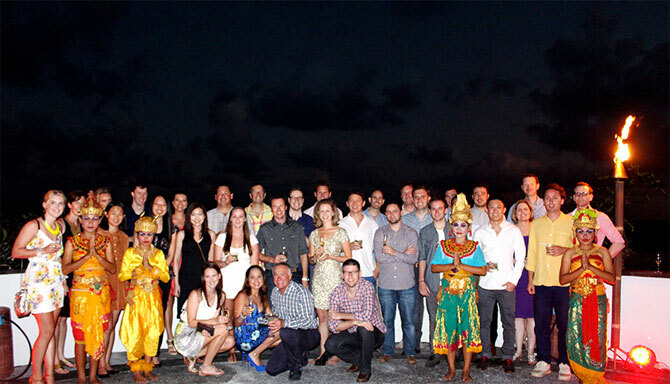 On Saturday, 14th September, 2013, Azure Capital, a leading Perth-based financial institution hosted a cocktail gathering, followed by dinner at the main pool side of Samabe Bali Suites & Villas. The group was in Bali for team building, internal conferences, and leisure in various locations in the island, organized by Destination Asia Indonesia. The company that has gained international recognition arrived at the resort shortly after sunset and was welcomed by Bali's famous 'Kecak' dance at the resort's Ring of Fire. Signature classic margarita and classic mojito were served as the guests were enjoying the attraction, one of Bali's classic performances that involved more than 30 dancers. The rhythmical chants of the male dancers and the dancing fire of the torches around the exotic cylindrical venue set the evening's delightful mood just before dinner. 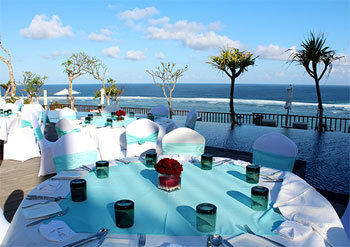 The waiters and waitresses escorted the Azure Capital guests down to the pool side area where round banquet tables were set up. Velouté of cauliflower with roasted garlic crisps was first served as appetizer. A live quartet band played soft music as the guests were dining. For the main course, the guests could choose Tournedos of Aberdeen Angus beef tenderloin, Burgundy jus and braised ox cheek cannelloni, or Fillet of Mahi-Mahi with pistachio crust and rosehip emulsion. Panna cotta with raspberry sorbet shot of passion fruit closed the dining experience in a delectable tropical note. The clear sky and soft sea breezes complemented the night and kept the guests in good spirit until around 10:00 p.m. when they started to leave for their next weekend hangout in Bali.